Yesterday, May 3, 2017, the news broke that Wicked Weed is selling to Anheuser-Busch. Lots of people congratulated Wicked Weed, and plenty of people had negative things to say. This is because Wicked Weed has a massive fan base who LOVE them. On Facebook, the announcement had thousands of angry and sad reactions. I personally have 1 sticker on my vehicle, a tiny, clear, Wicked Weed logo. They make great beer. Asheville, North Carolina has become craft beer central, and Wicked Weed has played a huge role in that. I don’t know how they do it, but they make a wide variety of amazing craft beers including IPAs, sours and stouts. During the 2015 Super Bowl (Super Bowl XLIX) Budweiser took a swing at craft beer enthusiasts. If you can’t beat them, buy them? These days I mostly drink craft beer. It is a delicious treat. Somehow my tastebuds began to like it when I turned about 37yrs old. There are craft beer shops all over NC where you can walk in and there is always something new on tap. I love it. There is a small bar down the street from me and I could go every weekend and never have the same beer twice. This is not a trend that is going away and people all over the planet are brewing all sorts of delicious beers. Anheuser-Busch knows this. I do not blame Wicked Weed for selling their business. Almost all successful businesses have people to buy them and if you were in their shoes you’d do the same thing. I sold a business in 2012 myself. It was a great accomplishment. I congratulate them and I will continue to consume Wicked Weed beer as long as they focus on making great beer as they have promised to do. Where did the Facebook Post go? 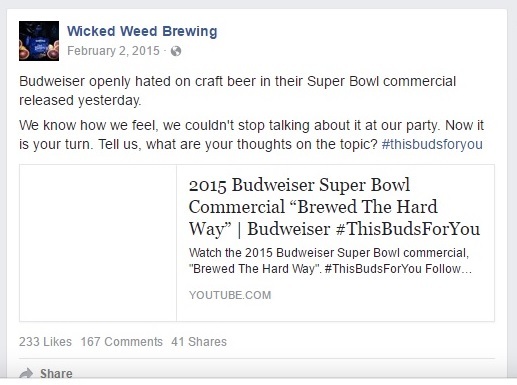 I looked for this Facebook post today to see if Wicked Weed deleted it or not. They did. Thankfully, Google had it cached. The post was still present the last time Google crawled the page, which was just 2 weeks ago: April 16, 2017. This is the original URL, which no longer works: https://www.facebook.com/WickedWeedBrewing/posts/282197345237506. Budweiser openly hated on craft beer in their Super Bowl commercial released yesterday. The post is deleted and I have no idea what the comments stated, but I sure would love to see them. It will soon disappear the next time Google updates its index. Hopefully Wicked Weed does not begin changing. It is great the way that it is. Hopefully the Facebook post being deleted is not a sign of things to come. Feel free to tell the world your thoughts below.